There are a few stories we see every once in a while about people finding clever ways to play Pokémon GO and cheat the system. And some of you out there may be pretty clever, but you’ll never be 11-phones-on-a-bicycle clever. 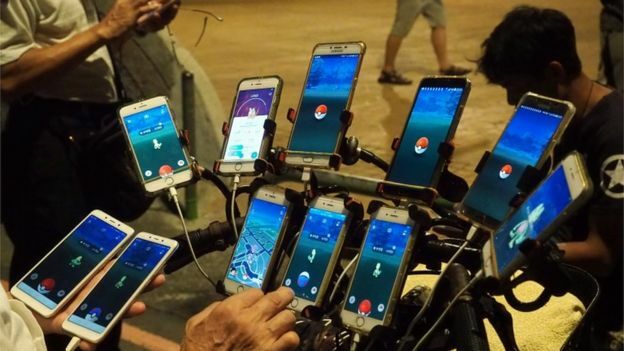 That’s what one Taiwanese man has done, according to a BBC story, in which a man named Chen San-yuan rigged several phones to his bike so he could play Pokémon GO on the go. He learned about the game from his grandson and got so involved with it that he bought multiple phones to play the game around town at a slow enough speed to hit every spot possible. And when one phone dies, he can switch to a fully charged phone with the same account, giving him about 20 hours of gameplay between all of them. Considering his phone bill is almost $1,300 for all of them together, we really don’t recommend that you do this. You know, unless you’re super obsessed with the game and have a ton of cash to burn with a bike that won’t die on you. No matter what, you gotta give the guy points for creativity. That’s a hell of a way to make sure you catch ’em all.